The Rider1000 is a non-competitive endurance riding event that consists in riding 1000 kilometers around Catalonia starting and finishing in the city of Manresa. The 4th edition was held over the past weekend, and I took part for the second time. I heard about for the first time only a day before the inscriptions for the previous edition closed and I did not have time to convince anyone to take part with me. This year, however, I managed to convince two friends that it would be a great idea to get up before 6am and spend 20 hours riding almost non-stop in winding roads. 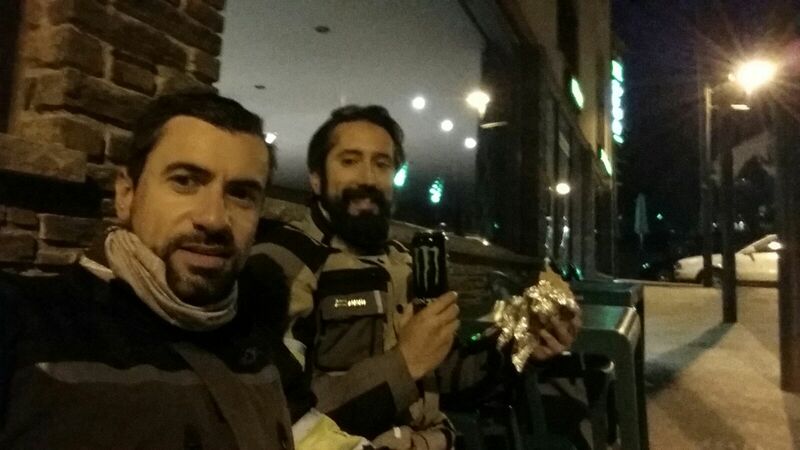 Not only that, three more friends who are relatively new to riding decided to take part in the 500km version. With more time to plan things we decided to try not to repeat some mistakes I made last year. First of all – enter the event early. Departures start at 6:00 in order of inscription, meaning that last year I was second to last to take mine, at 7:15. By the time the sun set I was just reaching the checkpoint in Horta de Sant Joan, the furthest point from the finishing line in Manresa and I had to ride for four and a half hours in the dark. I finished at 1:17. The second mistake was not booking accommodation for that night – I thought I would just go back home at the end, but riding an extra 50km on top of the 1000 already done was too much. With that in mind, we tried to get an early start slot, but the Rider seems to be growing in popularity, and even though we entered it only two hours after inscriptions opened, we were given numbers 578 and 579 and scheduled to start at 7:35. Well, at least we addressed the second mistake and booked an apartment in Manresa for the night before and after. There was rain forecast in the whole of Catalonia for Saturday. We woke up at 5:45 and when rode to the organization tent to get our breakfast the sky was overcast, but it was not raining. We had a sandwich and a coffee and then moved our bikes to the assigned departure lane. A few minutes later, our turn came – the passports were stamped, our inscription numbers checked and noted, we had our picture taken in front of a sponsor board so fast that we did not even have time to strike a decent pose (I’m not going to post the result) and we lined up behind the starting line, ready for our turn. At precisely 7:35, we got on the starting ramp, waited a minute to allow a gap with the 6 previous riders, and were given the go! It was 72km to the first checkpoint, the first bit on a fast national road, and like on the previous edition, the prospect of 850 eager riders let loose on the road was an opportunity that the police could not let escape – they set up a speed trap and at least one undercover patrol car on that bit of road. We got lucky and some riders coming in the opposite direction warned us to slow down, but we saw a few other riders who were not so fortunate and started the day 300€ lighter. The police must have made enough to buy a few new patrol cars. Things got interesting quickly after that when we left the main road for a much narrower one in Queralt, with a 18% gradient that put our bikes to the test. A lot of riders were in a hurry to get as many kilometers as possible done early in the day and some of them took too many risks overtaking. It was not long before we saw a bike in a ditch, its rider unharmed, fortunately. We got the first stamp on our passports in Les Pobles and headed off to the second longest stint of the day, 96km to El Lloar. After a cold and cloudy start of the day, the sun came out and we enjoyed one of those rides where everything is just perfect – road, weather, scenery… we were in the heart of the Montsant mountains. We only stopped for a moment in the second checkpoint before pressing on another 53km to Prat del Compte, which we reached at 11:42, almost half an hour earlier than my original calculations, so we took the chance to rest for a moment. While we were having breakfast we heard some guys on GSs talk about an accident that had just happened outside the village – it seems that shortly after leaving Prat del Compte the police had set another speed trap behind some bushes on a long straight. The first bike of a group had seen in time and he braked to avoid a fine, and some guy in a crotch rocket had rammed into one of the GSs. Fortunately he had managed to avoid rearending it full on, and the result was only a bent gear lever and side stand on the GS and two unharmed riders. The guy on the R got the worst part, though, he ended up on the ground with a lot of broken plastic on his bike. You could say that by setting up that speed trap on a perfectly safe straight bit of road with no junctions and long distance visibility the police had managed to cause an accident instead of preventing one. 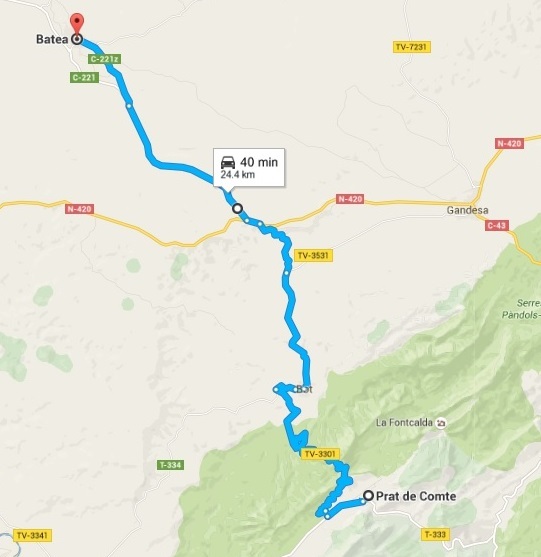 As we were leaving Prat del Compte – riding slowly, for sure – we saw the police car with the speed gun and next to it an unhappy looking rider and his now naked bike waiting for the recovery truck. We turned right shortly after for the road that connects with Bot across the Pàndols mountains. Next checkpoint was a mere 23km away, but this was the most winding, narrowest bit of road we’d encounter all day. So narrow in fact, that there were mirrors in some of the corners to check for incoming traffic! Luckily, the road was empty bar from the participants in the Rider, and we were all going in the same direction. It was still sunny when we reached Batea, the most southwestern part of our journey, but when we hit the road again heading back northeast black clouds were looming ahead of us. Most people think that the hardest part of the Rider1000 are the last 3 or 4 hundred kilometers, when it gets dark and you are still a long way from the finishing line, but I have found on both my times in the event that once you have passed the 500km mark your body just finds a groove and settles into a calm routine of riding no matter the conditions. No, the hardest part for me on this occasion was the moment between the 250-300km. It was not a particularly long stint to the next checkpoint (59km), we were on time, it wasn’t raining, it was not too cold, and the road was quite good, but my back started to ache – I had made the mistake of wearing a backpack with some food and a CamelBak instead of strapping it to the seat – my contact lenses were starting to get dry and I realized that we had barely covered a quarter of the whole distance. For the last 20km or so I rode behind a guy on a Kawasaki with an IXIL exhaust that made a horrendous noise, and he was riding at annoying speed that is too fast to overtake on a road with not a single straight stretch but too slow to get some distance between me and him. By the time we reached Margalef I had a slight headache, and to make matters worse I saw that I had forgotten the Ibuprofen I had packed for cases like this in the apartment. Damn. The organization were providing lunch at the next checkpoint, so after putting on some eyedrops to hydrate my contacts we decided to press on to be able to eat at a decent time and to hit the road ahead of the Kawa. It is funny how fatigue works – for the next stint I was feeling just fine. Maybe it had been the noise from that guy’s exhaust, maybe I was looking forward to lunch, maybe an intermediate fuel stop helped, or maybe the roads were faster, with more flowing corners now, but even though it was 89km to Montgai, they felt very short and I was feeling fresh again. The main street in Montgai was packed with all kinds of bikes, which was surprising because we had mostly been riding alone all morning, finding other participants only at the checkpoints. Either we had been getting very lucky with traffic or we were two of the few following the recommended route and not cutting between checkpoints using motorways and main roads. 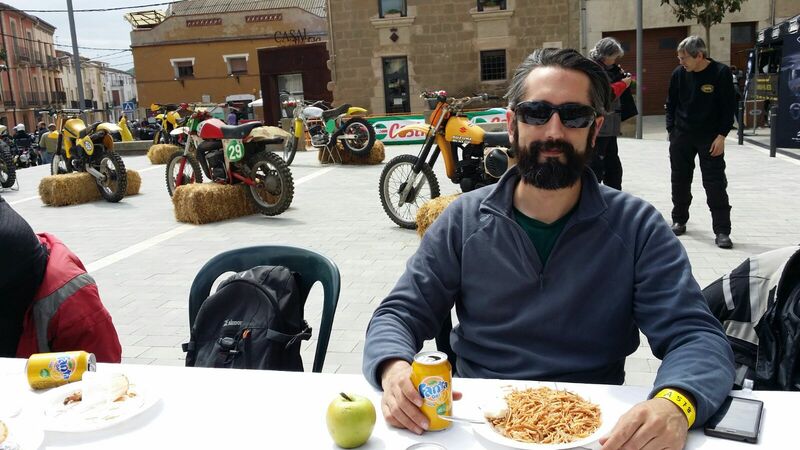 Anyway, we sat down for lunch with a rather big helping of fideuà – yes, a light meal before hitting the road – and enjoyed a rest in the sun, which had come out again. There were menacing clouds in all directions, but we seemed to be following the very few sunny gaps in the clouds all across the country. It was time to head north now, towards the Pyrenees. If there was going to be rain after all, this was where we were most likely to find it – a high mountain range in the afternoon-evening. The next 64km to Cellers, on the banks of the Terradets reservoir, were a fast road, and everybody took the chance to make up some time in this stint. It felt so short that we had the after lunch coffee there, less than an hour from the previous checkpoint. And still no rain. We were not going to reach the Pyrenees just yet, oh no, they were going to make us work for it. After Cellers the route headed straight east in Tremp, then south in Isona and east again until we reached the checkpoint in Peramola, opposite Oliana across the river Segre. It was just past 6pm and we were still shy of the halfway mark. It was here that my phone ran out of battery – my mistake, I should have kept it in airplane mode and use it only to update the Facebook page at the checkpoints, but I did not think of it. As it turns out, most of the route took us across vast areas with no phone signal and it kept searching, thus drying the battery much sooner than expected. To make matters worse, I still had not had time to fit a 12V socket to the AT, so that was the end of my live report on Facebook. Sorry about that, I promise better logistics next year. 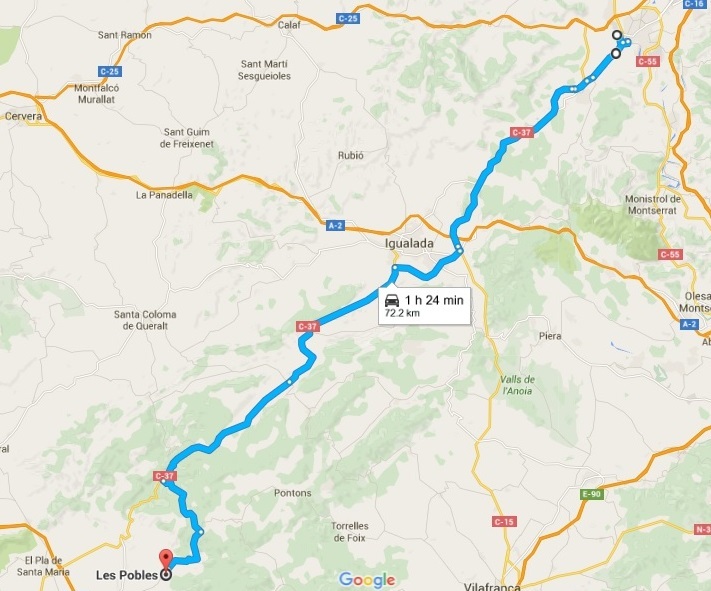 It was on the 30km between Peramola and Solsona when the rain finally caught up with us. Fortunately, it was just a light drizzle, and it had died down by the time we reached the 10th checkpoint and the equator of the ride. It was here that we learned that well over half the participants had already gone through the checkpoint, confirming our suspicions that some people were taking faster routes. Oh well, to hell with the clock, we were having a blast on the winding roads and were not going to stop now. 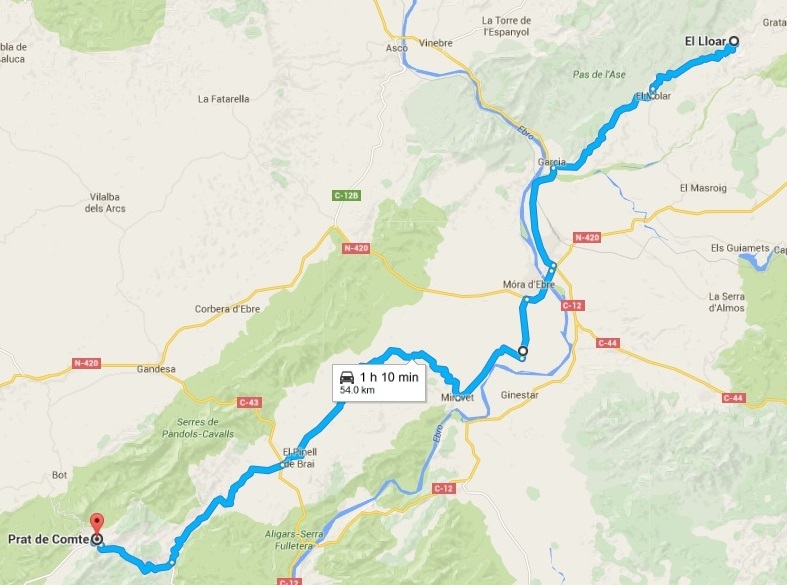 Next bit was going to be interesting – it was not raining, but the temperature was dropping and we were heading straight north to La Seu d’Urgell on tiny roads across Port del Compte. It was here that I made my only planning mistake – we should have cut across the skiing slopes instead of going around them, as we had to ride down the mountain around the southeast and then back up on the northwest side and we must have lost some valuable time there. Nevermind, the scenery was stunning, so it more than made up for the mistake. 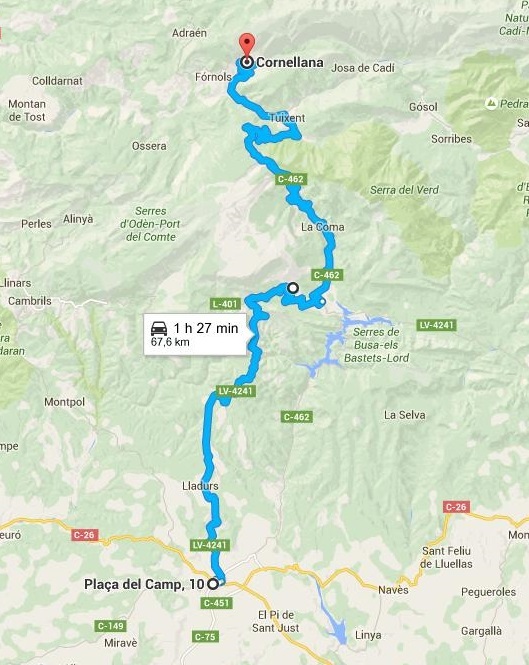 It was 66km to the checkpoint in Cornellana, in the middle of nowhere in the mountains, and then another 30km down to the main road in La Seu. Our bikes were quite low on fuel for this last bit, and there was not a single petrol station in any of the small villages and hamlets we rode across. The sun set as we were making our way down to the main road, but the clouds robbed us of what could have been a spectacular sunset over the snow-capped mountains. 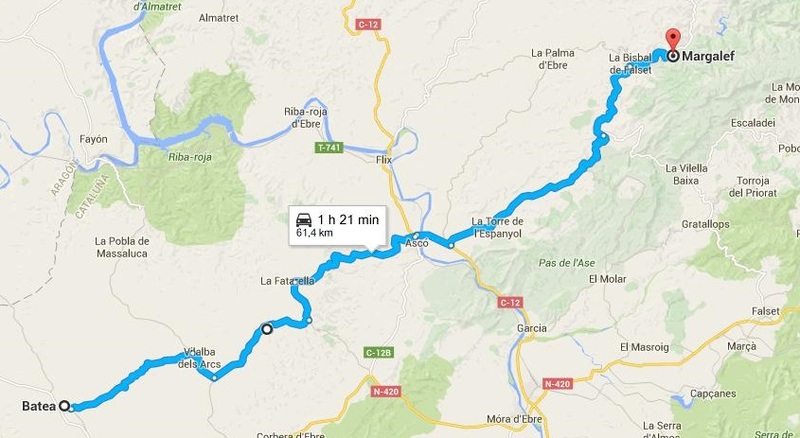 Once on the main road, we hurried to a petrol station between La Seu and Alp, the 12th checkpoint of the day. On the way there emerged from a tunnel into a very thick cloud of smoke. At first I thought it was a burning car, maybe an accident, but then we saw it was a diesel Volvo whose engine had started burning oil and was self-destroying at full throttle. A family were standing as far from the car as possible, looking terrified and possibly without a clue as to what was happening to their car. My friend later told me that the only way to stop such thing is to block the admission of the engine to choke it, but unless you know exactly where it is and can do it quickly, I would not put my hand in that engine bay. It was already dark when we stopped at Alp, and we had a sandwich for dinner near one of the paraffin stoves they had lit up to keep warm. We only saw about five or six other bikes at this checkpoint, and wondered how many were there left behind us. The night time ride was about to begin. 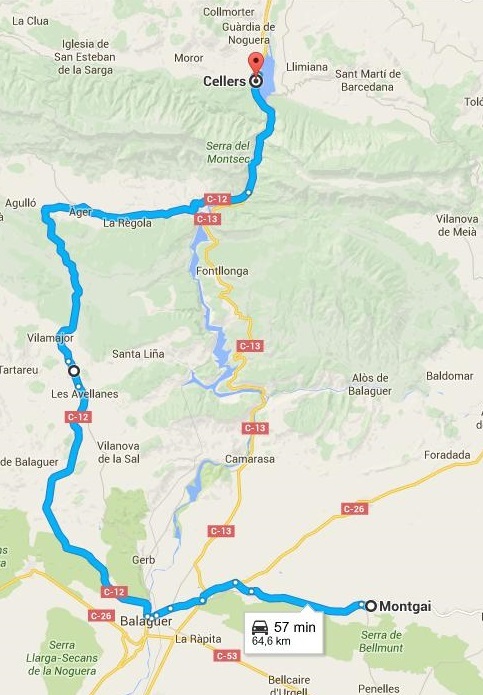 We still had a very long ride with four more checkpoints to go and it started with crossing La Collada de Toses, one of the country’s most famous mountain passes. In complete darkness. At this point we could have taken a shortcut through La Molina skiing resort, but we were feeling brave. Time for the energy drink I had been carrying all day. It went much better than expected, temperature only dropped to 5ºC at the top of the pass, and the LED headlights on the AT are rather excellent. On roads like this, however, I still missed having a pair of fog lamps to light up the sides of the roads, as in really tight corners I was basically turning into complete darkness. Not very confidence-inspiring… at least we could see the headlights of incoming traffic. Not that there was much, mind you, we only saw three cars, and that was on the way down, almost at the end. This was the longest stint of the day, 100km between Alp and the next checkpoint in Les Preses, just past Olot. Fortunately, after coming down from La Collada the road became much faster and we were able to keep up a good pace for the last 50km. We found the RODI workshop where the checkpoint was almost deserted, it was midnight and they told us that there were about 300 riders left to go through. Well, we were not doing that bad, we were numbers 578 and 579 out of 850, remember. After filling up for the last time (just in case, the bikes only took five litres) we hit the road. We had now 70km of main national road, and we made good time to the next checkpoint. I was surprised to see many bikes coming from the opposite direction and heading to the checkpoint we had just left. I guess thay had taken the tunnel to avoid La Collada pass, but that meant a huge detour, even if it was on main roads. We turned off the C-17 road and into L’Ametlla at 0:55. 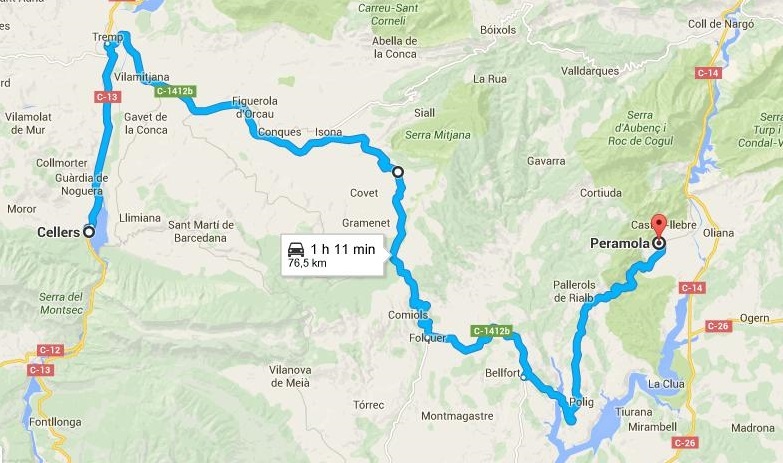 Only one more checkpoint to get to Manresa and the finishing line. Here most people kept heading south on the main road and the motorway and took a route that was 80km long and took about less than an hour. 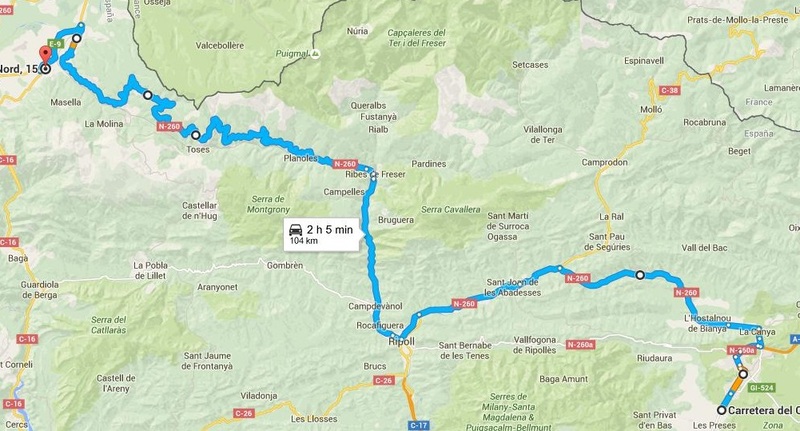 We thought we would do it properly and cut straight across the Sant Llorenç mountains, only 45km, but ‘to cut straight’ might be an optimistic way of putting it, as that road was everything but straight. We found no other riders coming the same way. We reached the last checkpoint at 1:58, the girls that stamped our passport so bored by now that they had been putting stamps on each other’s faces. Only 21km to the finish line now. We made our way down the mountain with Manresa city lights already visible below, and many bikers coming in the opposite direction from the motorway to get their last stamp before heading back down the same way. At 2:37 we turned into the car park we had left that morning, 19 hours earlier down to the minute, and crossed the finishing line. 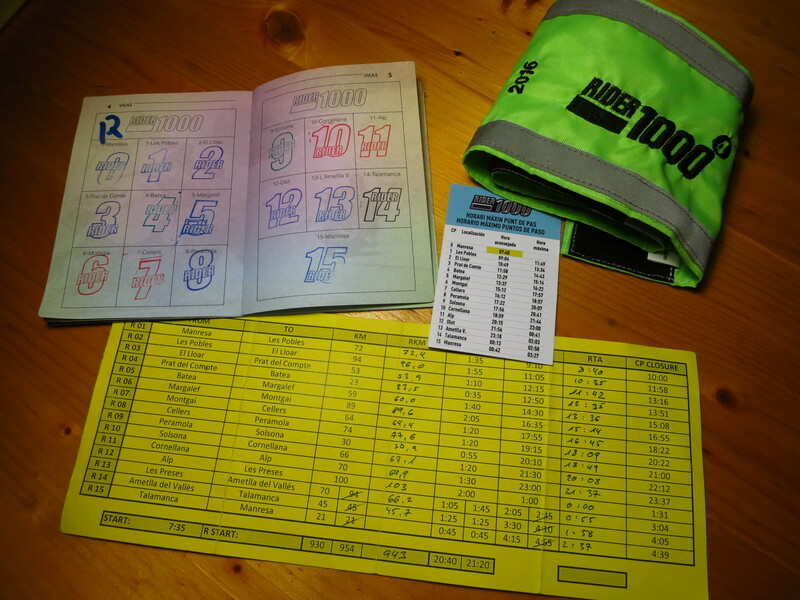 The Rider1000 is a long, grueling challenge, most of those 1000km are done on mountain roads with 2nd and 3rd gear corners, they are not relaxed motorway kilometers. 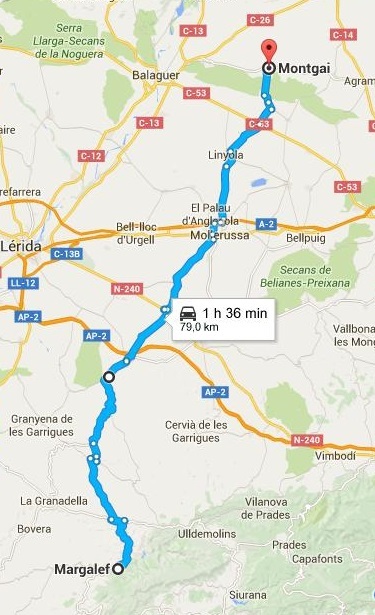 Our average speed on the move was only 63km/h, and we did not spend long on the stops. Despite all this, it is totally worth it, an amazing ride through some of the best roads and landscapes (at least until it gets dark!) in Catalonia. We will be back next year! This entry was posted in Rider1000 and tagged Honda CRF 1000L, Manresa, Rider1000 by Kilian. Bookmark the permalink.